Any manufacturer offer a splitter for a PT? Does anyone on the board know if any manufacturer offers a splitter for the front of a PT? I really like the looks of them, and they are functional to a degree. Any help appreciated. TIA! "Luck, when preparation and opportunity meet." Re: Any manufacturer offer a splitter for a PT? Last edited by CREWZIN; 01 Dec 2007 at 07:48 am. Yep, that's the animal I'm lookin' for. Especially the ones w/the stainless adjustment rods. Thanks, and if you come across anymore, please LMK! I would, but yor backing the wrong guy. Oh I like him too. You don't know how much I defend him to other driver's fans. You know the typical stuff people say, all because they are really jealous that their guy isn't winning and Jeff is. Besides, he drove sprint cars before he went to NASCAR and that's my true racing love. If ya can drive one of them and do it well, you can drive one of them NASCAR Taxi Cabs , NO PROBLEM! 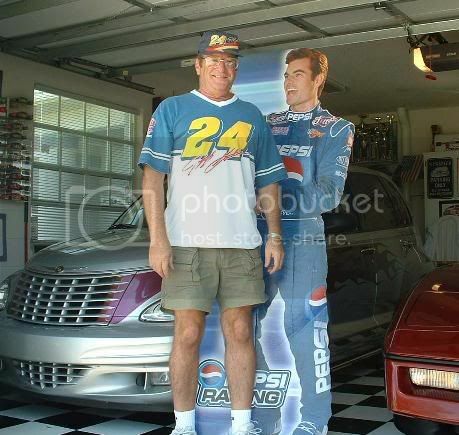 BTW, Ya know, ya can meet the real Jeff Gordon don't ya....? LOL! I've been to Dover, Pocono, Richmond, Bristol, Daytona and was in the fan club for 4 years but never had to chance to meet him in person. I met him years and years ago, when he was driving for his step father in a sprintcar. He was like 13 or 14 years old. He (his step father) had to sign a waiver to allow him to race here cause he was so young....LOL! Little did they know they were dealing with a future motorsports legend. I have a pic of him in the car here somewhere. If I can find it, I'll scan it off and email ya a copy. When I find it, I'll post here so you can send me yer email addy. That's if ya want the pic. LMK. Sure. have loads of signed pics I got from the fan club and at the track and even eBay but very few when he was that young. If I can find it, I'll get it to ya!